When Mizuno started the JPX range, it stood for "Japanese Performance Xtreme". 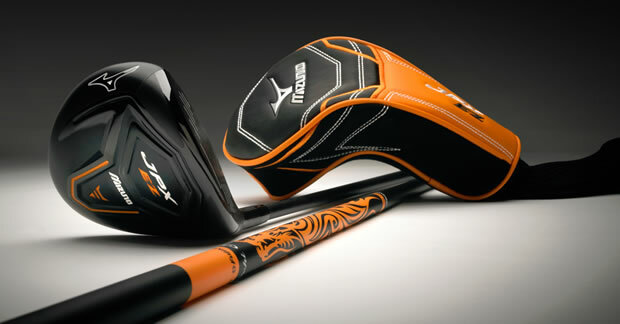 The latest addition to the range is a fairway wood that is designed to be extremely easy to hit, hence the name JPX EZ. A large head and new crown design combines with a deeper, faster face to, as Mizuno put it, "challenge your driver for more tee shots." Mizuno have opted for an understated, classic look throughout the JPX EZ range, with a modern touch coming in the form of the new orange detailing. The Mizuno running bird has made a comeback to the crown, aiding alignment alongside a contrasting black body and silver face colour. The crown itself is Mizuno's new Flex Crown. They claim the design helps to maintain high ball speeds and consistence distance control whether you hit it low or high on the face. Mizuno's R&D manager, Dave Llewellyn told us the crown technology "is mainly the geometry that allows the crown to flex more, thus spreading the COR AREA over a wider area, particularly center to high on the face." The headline technology in the JPX EZ fairway is the new Hot Metal face. It is deeper than before giving it a near driver-like performance off the tee, whilst the shape of the head stretches back and hugs low to the ground to create a lower, deeper weighting making it easier to hit off the fairway also. But the real secret is how the face is made and added to the club. Mizuno have created a very thin steel face, that offers improved feel and speed, and added it to a strong, stainless steel body. With the thin, rebound crown topping off the clubhead, you have a fast, strong clubhead with a low, deep centre of gravity. "The right JPX EZ fairway wood could retire your driver. We made the faces as deep as we could to make it more substantial from the tee - but stretched the profile way back so it was effortless to launch as well." commented Mizuno Golf Club Engineer, Chris Voshall. As well as thinning the crown and face, the R&D team have placed a typically-Mizuno emphasis on the sound and feel of the JPX EZ fairway. Using the company's Harmonic Impact Technology, they have fine tuned the design of the JPX EZ woods to try and produce a powerful, solid feel and sound. Unlike the JPX EZ driver, the fairway wood is non-adjustable, but is available in three different lofts. The good news for ladies is that Mizuno have designed a specific JPX EZ ladies fairway wood. The bad news for left-handed golfers is the JPX EZ is being released only in right-handed models initially. We test the fairway wood Mizuno say could "retire your driver".